Dirt he crushed underneath his feet with every step; small spurts of dust spurting forth from his steps. He never cared for Richmond, but knew it was important in the grand scheme of things. Montgomery was the true capital of the Confederacy; Montgomery was his home. But as the war progressed from the opening shots at Sumter, the capital was moved to Virginia because of its social stature and its threatening location to Washington D.C. The streets were busy; they filled with the people that shared the brunt of the war. It seemed Virginia was the eyes of the nation and after all the invasions from the Northern Leviathans, the eye of the nation had bruised. But there the building stood, in all of its glory. Strong, the foundation, as it remained erect in the streets of Richmond, Virginia. It stretched three floors into the sky with a row of windows, each closed during these winter months of January. A veranda stuck out in the front center of the building supported by a simple set of columns with the glorious stars and bars waving above. The freedom of a foreign power symbolized in the same manner as the enemy. This was the Confederate White House. In this temple, his uncle, the President of the Confederacy, resided and tended to all the principles and orders of this nation and here in this house, Gods visited him. Colonel of the President’s War Staff, Joseph Davis, made his way to the steps of the building and sat on them. His uncle called him out to Richmond for some unknown reason, but he was not specific as to where they would meet. He would usually be at the war department on a day like this. But relaxation was all he desired as he sat down on the steps. He loved watching the people in the bustling streets of Richmond. Though he loved Montgomery, the place to watch the public was here in Virginia. People acted strangely in these streets that anywhere else. 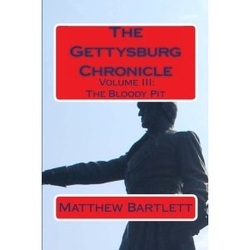 He saw a young man dressed in his Confederate Gray uniform kissing what looked like his wife or fiancé as he readied himself for the next campaign. Another woman walked by with a young child; a widow she appeared to be as her wedding ring lay on her right finger. A wedding ring on the right finger was always a widow. How sad what this horrible war has done to the country, Davis thought. Let us hope it ends soon enough. In 1860, when Mississippi was ready to secede from the union, he was elected to the state senate but as soon as the nation called for war, he was called to serve in it. Immediately, he was placed in a captain’s position and quickly moved up in the ranks. He was moved not for his gallantry like many others, but for his political clout with the President of the Confederacy. Being the nephew of the president sure had its perks, but in warfare, he was not sure if he wanted them. He knew this was why he was criticized. But no matter what other people thought of him, he knew he always did his job in command and did what was expected from the high command. A horse drawn carriage rode by and as he suspected, stopped in front of the White House. He thought for a moment his uncle would step out but he did not. It was someone he could not put a name to. The man who stepped out looked Davis up and down and shook his head back and forth. “I don’ believe I’ve seen you before,” the man stated. “Have you faced battle before?” That’s right, Davis thought. He had no military experience, no training. No fancy West Point degree and no field work completed from the Virginia Military Institution. He was simply a lawyer from Madison County, Mississippi. Four months after he was promoted to Lieutenant of the 10th Mississippi, he was placed as a full colonel in his uncle’s staff in Richmond for a year and a half. In September of 1862, his uncle recommended him for a spot as Brigadier General in the army but the Confederate Congress, in a showcase of courage, quickly denied the motion. However, two days later, the Congress voted again and the motion passed for him to receive his stars as a general. Davis only hoped it was for this reason he was called to see his uncle. The other man was still staring at him in a strange way. He stared at the young colonel sitting down near the doorway to the house. Davis was still puzzled to who this man was. He had a long beard and he peered through his eyes at the young Davis. “Sittin’ on the steps of the White House, son, ain’t gonna get you in.” This man stated to him. Davis saw the stars wrapped in a wreath around his neck and noticed this man was a general. “Yah, you sittin’ on the steps of the White House. Why you be doin’ that?” The door creaked open behind him and Davis quickly turned around to see his uncle standing there with paper in his hands. He got up and saluted the President who quickly gave him a hug. “Sorry, uncle,” Joseph replied. “Holidays and all.” The President chuckled. “Holidays during wartime. I still worked through it,” Davis remarked with a grin on his face. “Are you disappointed in me, uncle?” Jefferson Davis, staunch president, patted his nephew’s arm and grinned. The halls were quiet today. Not much paperwork cluttering the desks. The recent victory at Fredericksburg posed no pressure on Richmond. Some Christmas decorations still hung from the rafters of the ceiling, no doubt servants being careless, Davis thought. The two men headed down the hallway to the president’s office. Davis Sr. opened one of the hallway doors and threw the correspondence that he had in his hand onto the table. Joseph knew what that room was. That was the war room, where all messages come and go. “What was that, uncle?” Davis asked. “Don’t you worry,” the president responded. The other man that was with them had not said a word since they entered the building. It was a strange quiet. Was that correspondence a report on their work? He began to feel worried. The president creaked open the large wooden door to his office and the three stepped in. The golden and scarlet carpeting met the solid wood desk that lay in the middle of the room. Across from it was a couch with blue upholstering and a few chairs in the same decoration. The president sighed and sat down in his red upholstered chair placing his hand on the surface of the wood. “He’s a politician from Virginia.” Kemper held out his hand for Davis to shake it. The man who had a temper outside had now turned into a dignified gentleman. Was it because he was in the presence of the president or was it because he had found out who Joseph was? “Pleased to meet you, sir,” Kemper said to the young Davis who still looked confused with the situation. What was his uncle getting at having him meet with politician generals here? James Lawson Kemper graduated from Washington College with a law degree and started a legal practice in 1846 during the outbreak of the Mexican-American War. He enlisted and was given the position of quartermaster captain, but by the time he reached the lines of action in Mexico, it was all over. Upon returning to Virginia, he went immediately back into law and was elected to the first three terms of Virginia’s Legislature and was eventually voted into Speaker of the House of Delegates. Though he had no military training, he became the chairman of the Military Affairs Committee just a few years before the Civil War hoping it would prepare him for military action. “Mr. Kemper here,” Davis started, “is quoted as saying to many of his own troops, ‘I’m here for the votes,’” President Davis said, chuckling. “Yah wan’ me tah lie to my men?” Kemper asked in his thick accent. “So what do you want from me?” Joseph asked his uncle, enjoying the moment. “A soldier’s mindset is survival,” Kemper chimed in. “They care not for deception, as lawyers or politicians do. No offense,” Kemper said to the president. “All they care about is getting’ back to their loved ones. And you have to be attuned to that.” Kemper said, using his hands to speak during his speech. “Now Joseph,” Jefferson Davis said towards his nephew, “I want you to understand I had to appeal twice to the Congress to get this appointment for you. They thought it nepotism the first time I offered the promotion for you. Don’t let me down,” he said, pointing his finger towards his young nephew. Joseph held himself in salute towards the president, Jefferson Davis returning the gesture. “I will make it a point uncle, that you are worthily represented.” Jefferson Davis shook his head in thanks and Joseph lowered his salute. “If you don’t mind, nephew,” the president began. “Mr. Kemper and I have some business to attend to,” Davis said pointing at his Masonic ring. Though he had no inclination to join the brotherhood himself, Joseph Davis knew that most of the family had joined the order. With full respect, he left the two in the president’s office walking out of the building with great glee. He had finally climbed the ladder to the stars. He would receive his honors soon enough on his uniform. Insignias and medal of war; a politician’s ticket to a high office.